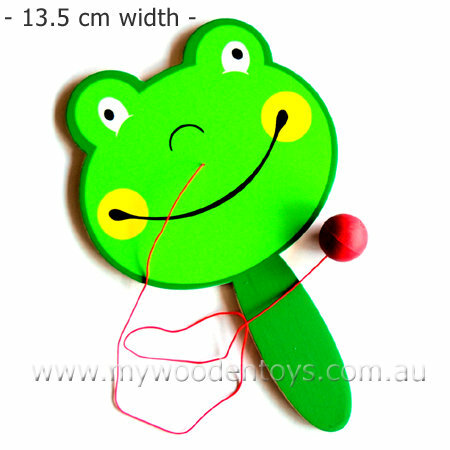 Wooden Elastic Paddle Bat Frog is a classic toy which has been around for generations and consists of a wooden bat, rubber ball and a piece of elastic. The idea is to hit the rubber ball against the wooden bat. The ball is on a piece of elastic attached to the centre of the bat so it shoots back very quickly. This is where the skill comes in as you have to have quick reflexes to keep the ball going and bouncing off the bat. This is a great little toy and is much harder than it looks a fun, active game which is very good for the reflexes. Material: Wood, Child-safe paint, rubber ball, elastic. We like this because: "great fun a real challenge."